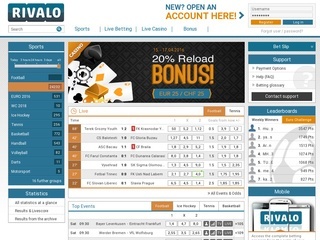 Rivalo is one of the higher ranking bookmakers in the world reaching top 100 of the most famous betting sites in under three years. The site was first launched in 2013 which makes it one of the new businesses in the industry. The company’s headquarters are based in the Virgins Islands (US). The bookmaker is under the jurisdiction of Curacao. They target mainly players from Turkey, Switzerland, and Austria. Despite the fact that the site hasn’t been in the gambling business for long, it has already earned its place in the gambling world, competing with many already established bookmakers. Popularity has boosted recently with the site reaching top 50 of the most visited platforms in the betting industry. Owners of the platform are the 247SportsInteractive B.V. The company has adapted the knowledge from the biggest German betting site Tipico to make their gambling platform, and so far it seems like a very good move. The most players might say that this online bookie is too young and inexperienced, but in fact, the management of the company is actually very proficient. The main figures who stay in charge of the Rivalo’s gambling operations are experts from the branch with excellent expertise and numerous successful ventures in the past. Once you enter the site, you’ll find the interface is very useful and friendly and easy to use. Setting up a new account is a breeze, and you can find the menu in the top right corner of the screen. On the left side, you’ll find the “Sports” section where all the action is. As a European-oriented site, you’ll find that Football is at the top of the menu. Basketball, Tennis, and Ice Hockey also have a very respectable amount of wagers available and rare sports like Darts, Bandy and Snooker are there for fans who like to gamble on them. Live betting is supported with statistics available at the top of the menu. There you can follow every yellow card, goal, and even corners while they’re happening. Another great feature is the indication of the odds getting worse or better (the color green for better and red for worse). Upcoming live betting events are available at the bottom of the screen. For gamblers who don’t like to bet on sports and look for other games, the casino section of the site is filled with content, such as video poker, video slots, table games (roulette, baccarat, blackjack) and many others. The site, of course, offers a mobile platform which supports IOS and Android. The mobile version is very simple and loads quickly which is very nice for people who have slower speeds on their mobile device. 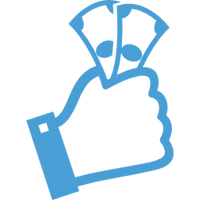 The site has gained its popularity based on an already tested platform, and they don’t disappoint in the offered bets as well. As a betting site that targets European customers, it’s not surprising the site only has the EU (Decimal) odd format. Speaking of depth and the markets available football is king here with over 15 000 markets to bet on, almost every day of the week. You can bet on more than 50 odds on a single football match. There are the well-known 3-way, Double Chance, Handicap and draw on bet odds. Special bets as “Who will score the last goal?”, “Does the team score at least one goal?” and “How many goals will the team score?” are also available for players who like more specific bets. In the Tennis section, you’ll find Match Odds, Set winner, and O/U played sets. The company has a very well adapted and safe platform that offers its users very secure and pleasant gaming experience. “Rivalo” uses the SSL encryption that protects the user’s data. 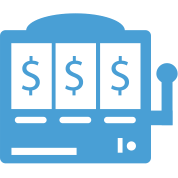 Customer support is 24/7, and the company encourages players to contact their employees with every question concerning gambling on the site. While they don’t have phone support or email their contact form is easy to fill. Response time is usually quick at you’ll get the answer to your question the same day. The site supports nine languages with English being the main one. You are free to check the available languages and all the contacts in the tables. Their many deposit methods made available for Rivalo to ensure that users don’t have a lot of difficulties and start playing right away. Bank transfer and major credit cards as Visa and Mastercard are supported. Digital wallets as Moneybookers and Neteller are also available making a total of 9 deposit methods. Minimum deposit amount is €10 which is standard amongst competitors. Accepted currencies are various and they can be reviewed in the table. Maximum winnings are at the respectable amount of €100 000. As far as withdrawals are concerned you can use the methods you deposited the funds. Minimum withdrawal amount is also set to €10. The minimum betting amount is €0.25. Rivalo has some of the best bonuses in the gambling industry with the intention of keeping their loyal customers and welcoming many new ones. They offer a bonus of up to €100/CHF150/USD100/TL 250 for every new player that quite nice for a start. Once registered you can get the “Combination Bet Bonus” 25% on every betting slip that consists of five or more bets. The casino will offer 100% up to EUR 200/CHF 300/TL 500 bonus for your first deposit.